We picked blue chip stocks in the Dow Jones Industrial Average, and tried to balance analyst ratings, Price/Earnings (P/E) ratios, the latest news, and our own instincts. Even though there were only 30 stocks to choose from, it took hours to go over all the research we wanted to do to put together a portfolio, and come up with a good strategy. Most of our losses came very early on from Disney (DIS) that took a huge hit. For a short time, we were even in last place! However, we had a back-up plan, and if this contest kept going for a few more months, we are confident our strategy would have proven profitable. You can actually see in our performance graph that we out-performed the Dow during the whole trading period, so we actually beat our benchmark market! 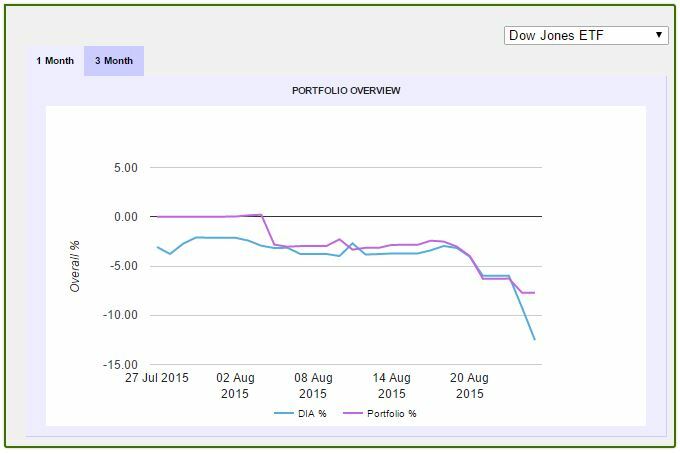 In future challenges, we will probably keep using a Dow ETF as part of our holdings. This is where we will keep track of the holdings for the Official Team HowTheMarketWorks Portfolio, with how much of each company we are holding, and why we picked those stocks. 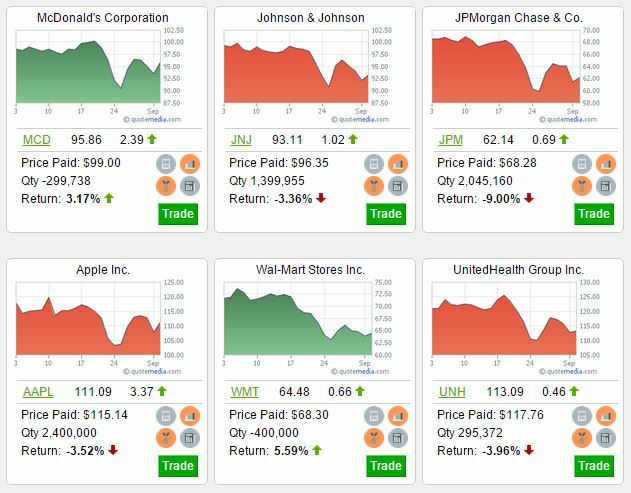 Remember, everything in the TeamHTMW portfolio is a Blue-Chip stock included in the Dow-Jones Industrial Average, some of the biggest companies in the world. For the full contest rules, how to participate, and what you can get if you beat our portfolio (or finish in the top 5 overall), Click Here! If you think we picked poorly, or want to brag on how badly you’re beating us, post a message to our Facebook or tag us on Twitter. We will be picking cool posts and tweets to feature on our feeds, so lets see what you’ve got! Only a couple weeks left in the competition, we are increasing our stakes in almost all of our current holdings! The only one we did not increase is McDonalds (MCD), because we read they are going to start selling breakfast 24 hours a day, which has the potential to really boost revenue. We are currently shorting them, and still think they will be down in the next two weeks. We’ve made the most so far on our Shorts, which were well placed for the global sell-off that hurt stock values all over the world. We have faith that our other picks are going to turn around in the mid-to-long term, but we are no longer fighting to stay out of last place! 2 weeks of competition left! Lets see what you’ve got! 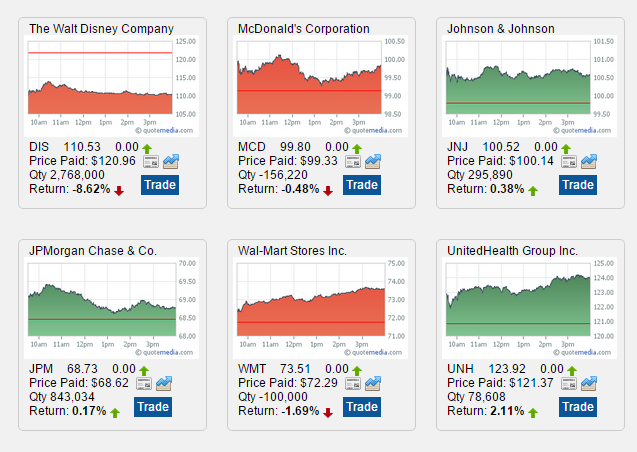 This is despite the DOW as a whole losing over 200 points today, so I’d say not too shabby! We were going strong, but we took a huge hit with our Disney pick! Today we will be cashing out as much Disney stock as we can, given market volume, and switching over to Apple (AAPL), which has been seeing a lot of good analyst ratings, and a P/E ratio of 13.3. 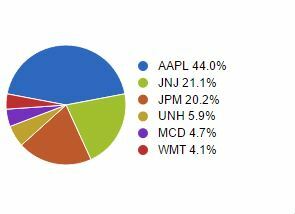 These are the stocks we picked to kick off the competition, but our holdings will probably change a lot as the competition goes on! JP Morgan is a finance juggernaut, it has been growing rapidly ever since the end of the financial crash, with no signs of slowing down soon. 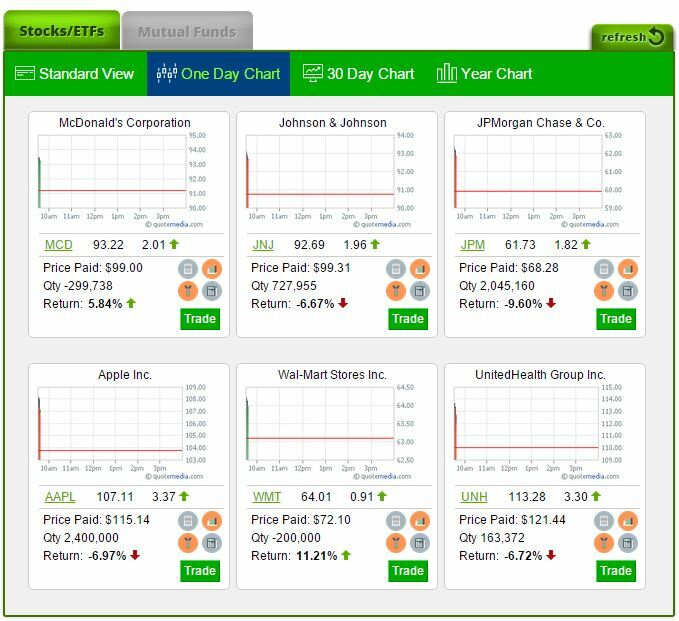 Their P/E ratio wasn’t that impressive (12.4 when we bought it), but their 3-month chart is pushing upwards, and both the Chaikin Power Tool on the Trade page and the Analyst Ratings in Quotes agree that it is a good stock to buy. Their news was not impressive though, so we will keep a close eye on this one. In terms of news, Walmart can’t really catch a break. They have constant bad will from consumers because of low wages for employees (although as we have covered before, that may be changing), and in popular culture they are usually regarded as nothing short of classless. However, we see a less-than-stellar P/E ratio (14.5), their 3-month chart is trending downwards, and no analysts we are seeing (both Chaikin and our Quotes analysts) seem to think it would be a great stock to buy (although they currently don’t recommend selling it if you already own it). We went short for now, and will keep an eye on it over the next week or two. Disney has been on a streak over the last year or two, with hit movies like Frozen tearing up the box office and merchandizing opportunities (we recently saw a Frozen Breakfast Cereal on the shelves, you know they’re making money on that! ), but their gaming branch has also been making waves around the world. The Star-Wars franchise is coming out with the first movies in the new series soon, and the Avengers appear unstoppable. To cap it off, their P/E ratio is good (25.8), and all analysts we looked at agree they were a good buy. Not too much to say about Johnson and Johnson, they have a pretty good PE ratio (17.6), and their 3 month chart is fairly stable. Most analysts agree they are a good buy, and we expect this to be our “least exciting” pick in this round. However, J&J have historically been a very solid stock to own, with very little drama and good performance even in shaky markets. At the end of the day, it is stocks like Johnson and Johnson that will anchor a retirement portfolio, so we are happy to have it on the team! McDonalds is another long-standing chain that is having trouble in recent years. Added competition from “Fast-Casual” restaurants like Chipotle (CMG) have been eating its market share, and it is so massive that even its constant efforts to refresh and improve its menu lineup are expensive, and never really received with much enthusiasm. It is just hard to think of eating healthy at McDonalds, although they are spending a lot of time, effort, and money to change that perception. We will see how that goes, but for now even their good P/E ratio (23.2) and decent 3-month charts are not making up for the bad press. 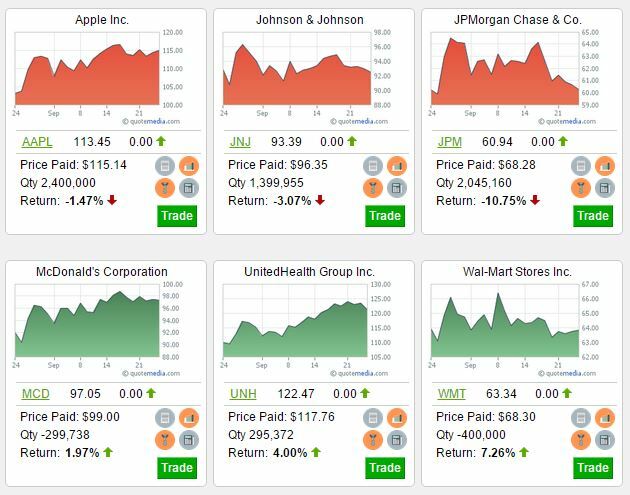 Insurance stocks are a lot like Johnson and Johnson; they usually will not attract too much attention, but they can be good anchors to a balanced portolio. 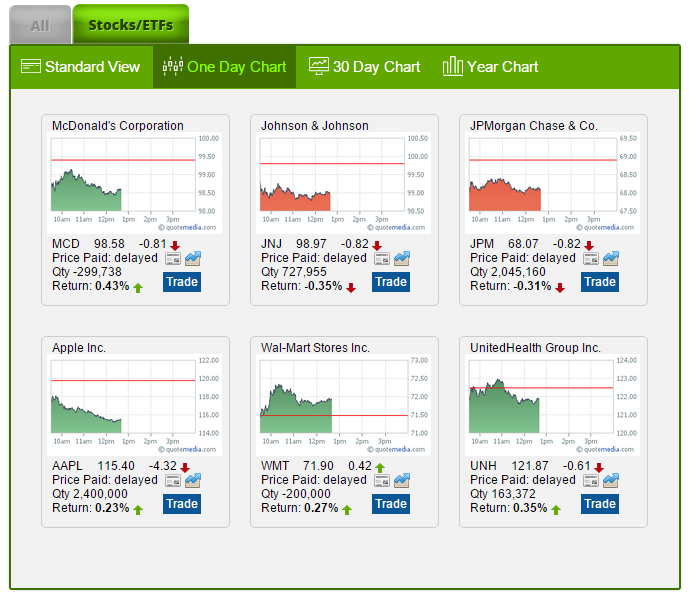 However, not all insurance stocks are created equal, in the DOW alone we could have easily gone with Travelers TRV. However, we stuck with United because we think their better P/E ratio (19.3 versus 9.8), stronger 3-month chart, and positive news made it a better bet in the middle-term. However, we will be keeping an eye on both, so don’t be surprised if you see less UNH and more TRV in our portfolio as the competition moves forward! Notice: This is not to serve as investment advice, only our picks for the Blue Chip Challenge competition, and why we picked them. 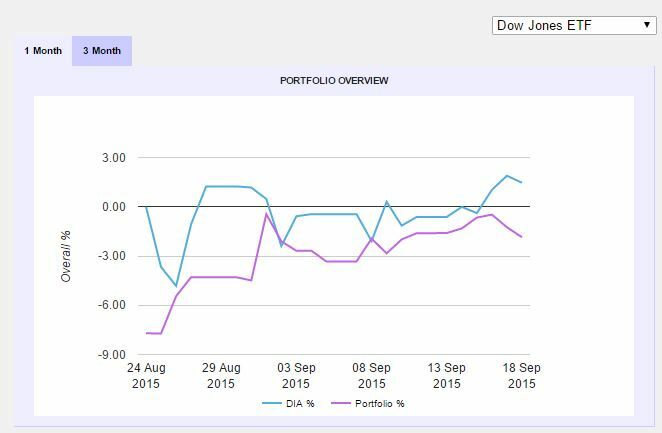 No person who chose a stock here owns that stock as part of their own personal portfolio.